Hey boo! Okay, so I am starting to have soooo much fun with these videos, sharing with you a bit of my world, what I’ve bought or added to my closet, and to connect a bit more! With my newest video, I am talking about my latest spree at HauteLook with wide width shoes, my new office accessory (because needed) and I have a special guest!!! 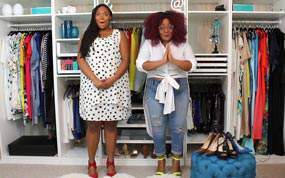 Since Shaina of A Thick Girl’s Closet was in town, I asked her to join me! And ohhh did we have a little fun?!?! So I have to ask you… how many of you shop for wide width heels on sample sale sites? You know like HauteLook, Neiman Marcus Last Call, Saks Off Fifth, or Zulily? I live on those sites… something fierce. Like every day, almost. So when I got my shoes in from my little spree at HauteLook, I KNEW that I had to share with you, my finds, deals, and scores- as well as introduce you to a fun office gift I got from Stadler Form! Take a peek at my latest video! Seeeeee? Accessories are sooooo necessary and depending on your style and aesthetic, you can find all kinds of accessories that will cater to you! For me, I happen to be obsessed with rings, dramatic earrings, and all things sparkly! Field Trip: Brow Game on Point with Microblading! One Item 5 Ways: Get Into These Wide leg Crops! Accessorize to Maximize: A Few Fave Accessories! Closet Confessions: 5+1 Things I am Loving Right Now! Obviously, we had too much fun! Sooo, what did you think? Are you digging the videos? Have a call out, shout out, or question that you’d love for me to answer? Drop it in the comments and I will do my best to accommodate! 12 Plus Size Bridal Boutiques JUST For The Plus Size Bride to Be!